My current work is an exploration of abandoned industrial architecture. The hulking, rusted forms of a decaying steel mill near Pittsburgh initially attracted my attention because they were so visually interesting. Their huge volumes coated with rich browns and grays in pronounced textures defined by the play of light and shadow seemed to me very beautiful. The subject contained all of the elements of the language of art. The original functions of the structures captured in my photographs of the Carrie Furnace Works are overshadowed by my primary concern for manipulating the shapes, textures and color to create dynamic statements. I combine parts of many images into intricate and sometimes dimensional arrangements. The compositions in this series are partly formal in nature, but nostalgia for the past grew as the work progressed. As an artist, my intention is to create visually compelling layered compositions, but I also want to acknowledge the labor-intensive phase of a once vibrant and powerful industry. The expressive potential became apparent while I cut and manipulated images of the massive forms into mixed media arrangements. The buildings and structures have long lost their vitality, but I can imagine the energy that was once there – the human effort required to build and operate these abandoned industrial places. This series is like a requiem, an expression of sadness for what we once had. 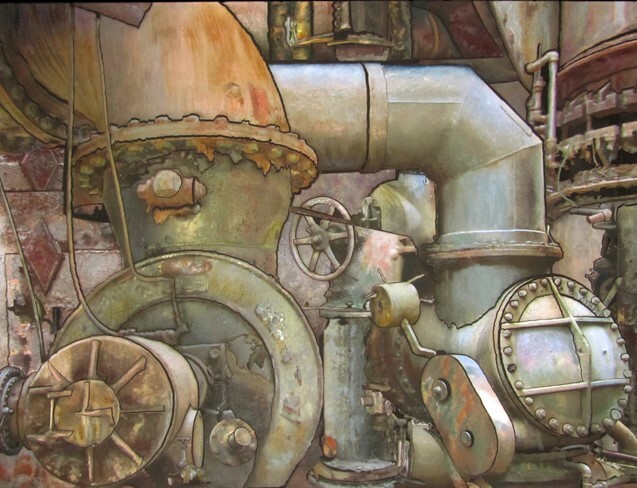 As I wandered through the Carrie Furnace works I felt the soul of the place – my artwork is a tribute to what is left of old technology and function. June Edwards holds an MFA in Painting from Brooklyn College and a BS in Art Education from Mansfield University. She has been teaching in the Art Department at Slippery Rock University since 2002, and is currently an Associate Professor. Her teaching assignments include design, digital media, painting, and drawing. She previously taught art at Peabody High School in Pittsburgh and at two schools in New York City: Graphic Communications Arts High School, and LaGuardia High School of Music, Art and the Performing Arts. Ms. Edwards was hired as a graphic designer for Arthur Andersen in 1984, and was the Operations Manager for the Metro New York Media Center until 1987. She worked as a freelance graphic artist at various companies in New York City and continues with freelance design work. Among other assignments, she assisted with projects for the Mr. Rogers Company, Del Monte Pet Foods, The Pittsburgh Children’s Museum, WQED Multimedia, the Entertainment Technologies Center, and the Sloan Foundation Television Project at Carnegie Mellon University. Ms. Edwards’ artwork is a combination of painting, drawing and digital media. Her work has been exhibited in regional, national and international galleries.